Plans for the first new homes to be built at Wichelstowe, south of Swindon, under the Joint Venture between Swindon Borough Council and Barratt Developments plc will go on display later this month. 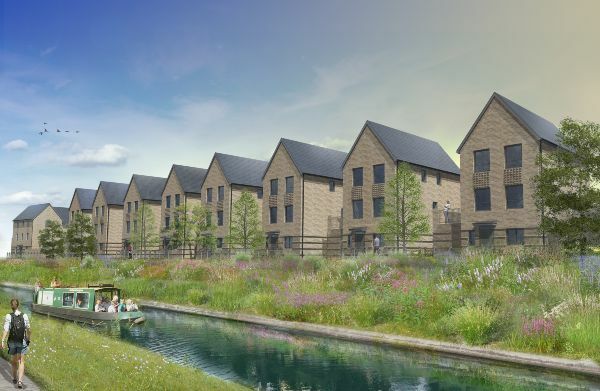 The new homes will be located next to the canal and adjacent to Waitrose supermarket, Hall and Woodhouse pub and the secondary school which are under construction. The phase, named Canalside, will feature a mix of one, two, three and four bedroom homes. The decision to extend the scope of the Joint Venture to cover this additional area of land was made by Swindon Borough Council’s Cabinet this week. An exhibition will take place in the Waitrose café on Tuesday 30th October between 3.30 and 7.30 pm where the plans for Canalside will be on display. Councillor Gary Sumner, Swindon Borough Council’s Cabinet Member for Strategic Planning, said: “We are making good progress on Canalside with the Wilts and Berks Canal, the new Deanery CE Academy and superb new Hall & Woodhouse pub really beginning to take shape. The joint venture company is a 50:50 partnership between Swindon Borough Council and Barratt Developments PLC. The scheme, on a 250-hectare area of land, will deliver circa 3000 homes over the next 20 years and includes two primary schools, a secondary school and an extensive area of open space. Homes will be marketed by David Wilson Homes and Barratt Homes. The new joint venture company combines the strengths of both the public and private sectors to create a high-quality and attractive development. More than 1,000 jobs will be supported by the scheme in the initial stages and the first residents are expected to move in late in 2019.